Rosa Manus (1881-1942) was an extremely energetic, internationally oriented feminist and activist. In 1935, she co-founded the International Archives for the Women’s Movement ( IAV), currently known as Atria. She was involved in organising many of the conferences and events of both the Dutch Association for Women’s Suffrage (now called Vrouwenbelangen) and the International Woman Suffrage Alliance, which was renamed the International Alliance of Women in 1926. Portrait of Rosa Manus. From the IAV archives that were returned from Moscow in 2003. Participated in the third international congress of the International Woman Suffrage Alliance from 15 to 20 June 1908 in Amsterdam. 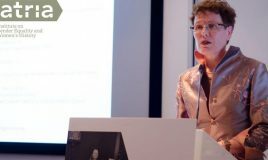 This was the start of her involvement in many of the conferences and events of not only the Alliance but also the Dutch Association for Women’s Suffrage. Appointed special organiser of the International Woman Suffrage Alliance. Organised the exhibition ‘Woman 1813–1913’ with Mia Boissevain. This event marked the Kingdom of the Netherlands’ centenary. 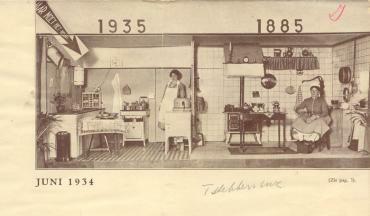 It focused on women’s positions in around 1813 along with developments up to 1913. Organised an important part of the International Congress of Women in The Hague, which had been convened by Aletta Jacobs. Held against the background of the First World War, it included women from both hostile and neutral countries. Appointed Secretary of the International Committee of Women for Permanent Peace, which was launched on 28 April 1915. In 1919, was renamed? Women’s International League for Peace and Freedom (WILPF). World tour with Carrie Chapman Catt, the President of the International Woman Suffrage Alliance. It lasted almost a year and South America was their main destination. 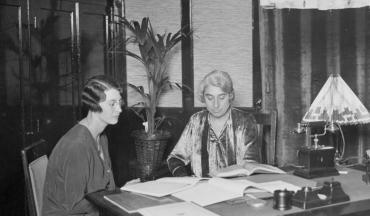 Rosa Manus founded the Dutch Women’s Electricity Association on 7 September 1932. Archive and magazine included in the Collection IAV-Atria. Organised the celebrations to mark Aletta Jacobs’ seventieth birthday. Appointed Vice-President of the International Woman Suffrage Alliance, which she was to remain until 1940. 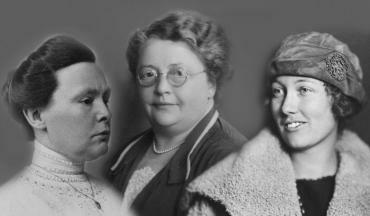 Appointed Secretary of the International Women’s Organizations’ International Disarmament Committee on 6 February 1932. She presented more than nine million signatures from fifty-nine countries to the League of Nations’ Chairman during the disarmament conference in Geneva. Still more signatures were received after the petition’s presentation that ultimately came to a total of more than ten million. – Journey to Egypt with Margery Corbett Ashby (Catt’s successor as International Alliance President), Germaine Malaterre-Sellier and Christine Bakker-van Bosse. Manus and Corbett Ashby then travelled to Palestine, while the other two went on to Lebanon and Syria. 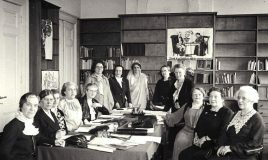 The objective here was to encourage women to attend the 1935 conference in Istanbul, which was to be the Alliance’s first international conference in a non-western country.  – Founded the International Archives for the Women’s Movement ( IAV) with Johanna Naber and Willemijn Posthumus-van der Goot. This institute was later renamed the International Information Centre and Archives for the Women’s Movement and has been known as Atria, Institute on Gender Equality and Women’s History since 2013. 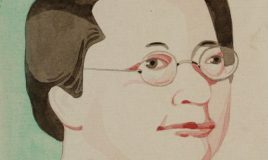 Rosa Manus donated besides her own papers and books the books and papers of Aletta Jacobs she received in 1930 to the IAV. – Organised the Rassemblement Universel pour la Paix pacifist congress in Brussels, where peace organisations from as many countries as possible gathered to protest against war and fascism. – Appointed by Royal Decree an Officer of the Order of Orange-Nassau on 22 August 1936. According to Elly Winkel’s diary, at that time Rosa Manus was in Brussels arranging the congress mentioned above and only heard of the appointment during a phone call on 29 August 1936. – Interrogated by the Belgian police for alleged communism on 1 September 1936. Last donation of Rosa Manus’s personal archive to the International Archives for the Women’s Movement in February. The IAV were closed by the Nazis on 2 July 1940 and ransacked ten days later. – Following various interrogations, Manus was arrested for ‘pacifist and international tendencies’ on 16 August 1941. She spent three weeks in prison in Scheveningen. – Sent to Dusseldorf in September 1941. She was imprisoned at the police headquarters, where the Gestapo also had its own interrogation facilities. – Transportation to Ravensbrück concentration camp leaving on 2 October 1941. Arrived on or around 25 October 1941. – Rosa Manus was most probably gassed at Bernburg in March 1942. 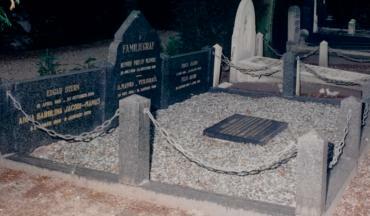 – On 23 July 1942, the family received a message from Ravensbrück that Rosa Manus had died on 29 May 1942. After the war, the Red Cross recorded 28 April 1943 as her date of death. For a long time, this was regarded as being the most likely date, as the Nazis’ announcements of deaths often turned out to be inaccurate. However, Myriam Everard’s research has since revealed that 28 April 1943 is also wrong. 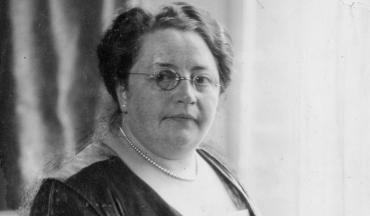 Born in Amsterdam in 1881, died and buried at the German concentration camp in Ravensbrück in 1943, used her organisational talent and knowledge of human nature, her energy and ability TO HELP THE ADVANCEMENT OF WOMEN. Few have surpassed Rosa Manus in dedication and selflessness.